Sometimes… most of the time..? All the time?! No, probably most of the time, the simple stuff is the best. Cod, potatoes, butter sauce. That’s perfect, isn’t it? I think so. I’m going to complicate stuff a bit (duh) but the basis of this dish is really simple. A few ingredients and very straight forward flavors. We eat a lot of fish in Sweden and cod is kind of the king of the fishes. Or something. I tried to find the translation for this specific part of the cod (the back fillet) but I… well I failed. Maybe the English-speaking world does not make the distinction? 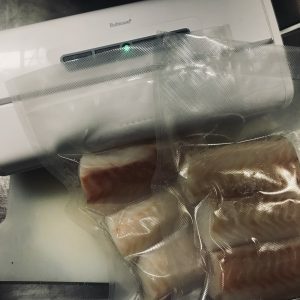 In this recipe I’m cooking the fish with the sous vide technique but it’s brilliant pan fried as well. It’s just a little bit easier to get it just right when using sous vide. Btw, I use the ANOVA sous vide machine, which I can really recommend. So what’s the deal with sous vide? Well, it’s pretty straight forward. Vacuum seal something in a plastic bag with some spices and/or butter or whatever you think might be good. Then put the bag(s) in a temperature controlled water bath at the exakt temperature you want your meat/fish/veggie/whatever to be cooked at, and leave it in there for a long time (as compared to the cooking time using more “traditional” techniques). I think it’s pretty rare to get well prepared fish at “not-high-end”- restaurants, and actually also at many higher end restaurants. Why? It’s almost always overcooked. Dry, overcooked fish is… I mean, it’s not horrible or gross or whatever but it’s just such a waste, right? When it’s juuuust right, it’s almost falling apart, it’s cooked through but only just so and it’s brilliant. When you’ve had that perfect thing, the overcooked one is such a sad reminder of what could have been. With sous vide, it’s so easy to get it just as you want it and basically impossible to fail. So you should really try it. Fill up a pot with cold water, add the potatoes and A LOT of salt. About 100 g. Seriously. Put it on high heat under a lid. When it boils, turn the stove off and leave the potatoes (under lid) in the boiling warm water. This is a pretty good trick when making potatoes. They come out just right (but check after a while anyway, I wouldn’t want overcooked anything on my conscience after that rant in the intro). Turn the oven to max. Set the sous vide machine to 47 or 48 degrees C and 45 minutes. Take the fish out of the brine. Rinse off the salt water and dry the fillets with some kitchen paper. Vacuum seal the fillets. Add som spices to the vacuum bag if you want! Put the bags in the sous vide machine (when it’s at temperature of course). Now, let’s make hollandaise! Bring a pot of water to a simmer. When it’s simmering put the stove on the lowest heat setting. Cut the 250 grams of the butter into about 2 cm x 2 cm big cubes. Mix 30 ml (2 tablespoons) of lemon juice with the egg yolks in a bowl. Put the bowl over the simmering water and heat the mixture while whisking. Use a metal bowl or at least something that can transmit heat. If you use a thick ceramic bowl the yolk/lemon mixture is probably not gonna get hot enough. When the egg/lemon mixture starts thickening, drop in a butter cube while continuing to stir/ whisk (if the egg/lemon mix thickens very quickly or becomes very thick, take the bowl off the water bath). When the cube has dissolved, drop another one in. Continue until you run out of butter. I use this technique instead of melting the butter first and then pouring it in to the yoke, as I think it’s easier to avoid the sauce breaking doing it this way. Add cayenne pepper, white pepper and possibly lemon and salt, to you liking. Note that you can’t refrigerate butter sauces. The butter sets and can’t be reheated without breaking. Put the remaining butter (50 grams) in a pan. Heat the butter in the pan until it starts to brown. Take the cod out of the vacuum bags and fry them for 10-15 seconds on each side. Be careful, the fillets can be very brittle. Serve with fresh herbs, some fried kale, a squeeze of lemon or something… else? If you use frozen fish (I did), be sure to thaw it gently. The meat easily becomes a bit thready and chewy if not treated carefully. Why low starch potatoes? Well, low starch potatoes keep their shape better when cooked and therefore fits well for this recipe (I think). Why all the salt? First of all: It’s not to make it taste very salty. It just gets…. tastier. A bit salty, yes, but not at all over the top (promise). I thiiiink it’s due to osmosis. The salty water is pulled in to the potato due to the higher ion-concentration in the water as compared to the water in the cells in the potato. The salt water adds moisture and saltiness to the potato, much like brining (it is basically brining). So that’s what I think, but the internet gives… differing explanations. Some say it (the better taste) is due to the potatoes being cooked at a higher temperature (the salt raises the boiling point of the water), but this seems implausible to me as the temperature is very marginally higher. Some do say osmosis but that also doesn’t seem quite open and shut. I have been planning on writing something about potatoes on the blog, primarily about this. Let’s hope I get to it soon. Oh, and I you know something about this potato stuff, do get in touch. In the meantime? 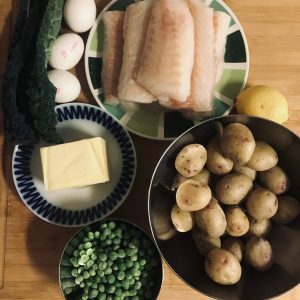 Get good at making cod and hollandaise. You’re in for a lifetime of tasty joy!